Since the beach season is just around the corner, many women want to look perfect in their bikinis. But there’s a catch – the bra bulge or armpit fat; women are embarrassed by this fat and do not want to open their bodies on public display. If you have the same problem, do not worry, you are not alone. 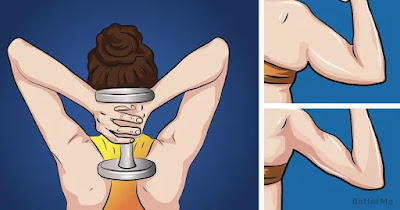 We are glad to present you with a list of 5 effective exercises to reduce underarm fat. Our exercises will help you tone and tighten your arms. You should perform exercises such as Shoulder Press, Tricep Extensions, Push Ups, Up Down Plank, and Side Lateral Raises. This 5-move upper body workout doubles as cardio so that you can both build muscle and lose fat. If you want to get the most out of your workout, you should choose a dumbbell weight that’s challenging. The combination of a killer workout and a healthy diet will give you sleek arms in a short time. Stop waiting for tomorrow, start your training right now. Just do it, ladies!